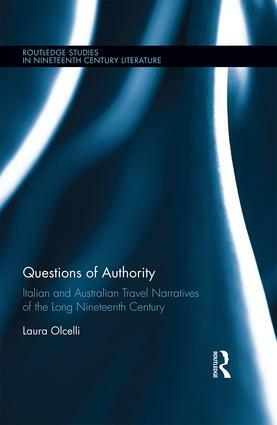 Questions of Authority investigates Italian–Australian literary travel exchanges throughout the long nineteenth century. The 1800s witnessed major transformations in Australian overseas travel: it gradually evolved from a replica of the Continental Grand Tour of the British, to a more idiosyncratic cosmopolitan experience, either touristic or professional. Moreover, it was during the second half of this century that both Italy and Australia underwent crucial political upheavals; these resulted in shifts from colonial and subjugated status, to self-government and ultimately independence. This volume connects these geographical, political and sociocultural contexts of Italy and Australia by considering their interlaced odeporic library, produced at a significant time in history. Additionally, this book analyses key texts compiled by Italians in Australia, and Australians in Italy: these chiefly consist of voyage accounts, but also include the records of explorers, missionaries, scientists and migrants coming from the Italian peninsula. These primary sources include unpublished travel diaries compiled by the first Victorian women visitors to the Bel Paese, which have been largely neglected by scholarship thus far. This examination pinpoints the enduring significance of Italy in travel-related terms, showing how this destination was adapted from the map of eighteenth-century British Grand Tourists, to that of nineteenth-century Australian holiday makers. Most critically, Questions of Authority argues Italian–Australian peripatetic connections entail issues of authority, that emerge in the ways in which Italian and Australian travel writers displayed their authorship, cultural capital and national identification in relation to the other country. Finally, it demonstrates how these are highly regulated by, and yet simultaneously challenge, British colonial hegemony. Olcelli’s book is a demonstration of the multidimensional aspect and shifting nature of travel writing. Tackling a very original argument, the book focuses on accounts of late 18th-century to 19th-century travels that took place both ways, to Australia (by the Italians) and to Italy (by the Australians), and proposes to examine issues of authority, peripatetic, as connected to authorship, and also of identity and how they are constructed and displayed in these accounts. Drawing on a large body of literature, critical, historical and literary, and well-grounded theoretically, in key texts from travel writing criticism and postcolonial theory, the book examines travel narratives, some of which unanalysed before, by Italians in Australia (part 1 of the book) and Australians in Italy (part 2), which evidence the changes in 19th-century travel writing as a result of the shift in the very purpose of travelling, which grew more professionally or touristically oriented, but also of the social and political changes that both countries underwent. Olcelli makes sure that the focus of her study is clearly defined and proposed in the thorough introduction of the book. The arguments are dealt with in a straightforward manner and written in a reader-friendly language. Laura Olcelli has recently completed a Doctor of Philosophy in English at the University of Sydney, Australia. Her research interests span exploration literature, women’s travel narratives, and travel writing – from the Grand Tour to the twentieth century, with a focus on journeys to and from Italy. She has published journal articles and book chapters in all of these fields. She is an awarded presenter at international literary conferences.